The EatBy Smart Kitchen App is a utility app that saves its users money and reduces food waste. It displays food stored in the kitchen, reminds users to eat food before it expires and includes an intelligent shopping list. The UK based husband and wife team who developed EatBy, Steffan and Barbara Lewis, designed the app in a bid to help consumers save money and to tackle the massive problem of food waste. 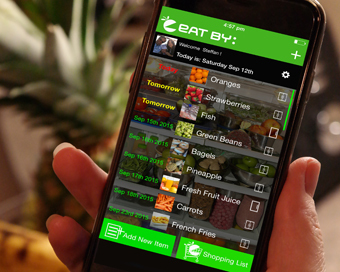 The free EatBy App includes an intuitive shopping list that allows users to input the expiration date. The app then notifies the user with a reminder that something needs to be eaten. When the app is opened it clearly displays what’s in the kitchen, fridge or freezer and the date it needs to be eaten by. Users of the app are now able to see what food they have in their kitchen at a glance and to make informed decisions that help reduce the amount of waste. It also cleverly allows users to quickly add recently eaten food items back onto their shopping list.